A big band like no other made up of 20 brass, 6 woodwinds plus rhythm - full, rich and resonant with some of the finest musicians in the country. A veteran studio musician and a composer of rare quality, Fischer began his studies in Grand Rapids, Michigan, at South High School with director of music, Glenn Litton. After receiving his master's degree in composition from Michigan State University, where he studied with Dr. H. Owen Reed, he traveled extensively with "The Hi-Lo's" as pianist-conductor for 5 years. About the same time, his musical ascension began with his critically acclaimed arrangements for Dizzy Gillespie's "A Portrait of Duke Ellington." Fischer's influences, absorbed along the way, are as distinct as his music: Stravinsky and Shostakovich, Bartok and Berg, Dutilleux, boogie-woogie pianist Meade Lux Lewis, Nat "King" Cole, Duke Ellington, Bud Powell and early Lee Konitz - Fischer's self-expression knows no boundaries. "I relate to everything," he explains. "I'm not just jazz, Latin, or classical. I really am a fusion of all of those, not today's fusion, but my fusion." In 1983 classical concert artist Richard Stoltzman commissioned Fischer to write a symphonic work using Duke Ellington and Billy Strayhorn themes. The resulting composition, "The Duke, Swee'pea and Me," features Stoltzman on clarinet and is performed with symphony orchestras around the world. More recently Fischer was commissioned by Stoltzman to write a "Sonatine for Clarinet and Piano" in three movements, which he has recorded with RCA on his album, "American Clarinet" and is being published by Advance Music in Germany. In 1986 Clare won his second Grammy Award - this one for his album, "Free Fall," the first having been won in 1981 for his album, "Salsa Picante plus 2 + 2." Since that time he has spent more time as a jazz educator, performing solo piano concerts and conducting clinics and master classes in universities and music conservatories in Scandinavia, Europe and throughout the United States. In the last few years Clare has appeared in Paris, Switzerland, Croatia, Finland, Norway, Germany with the WDR Big Band, Holland with the Metropole Orchestra, Austria in Graz and at the Vienna Konzerthaus and in Mexico City at the Ollin Yolítzli Concert Hall in a concert commemorating the music of Antonio Carlos Jobim on the anniversary of his death in December, 1996. In 1998 he also performed at the Choro Festival with Hélio Delmiro in Sáo Paulo, Brazil and returned in July, 2000 for a three-city tour in that country with Delmiro. In addition to Dizzie Gillespie, Fischer has written for Cal Tjader, George Shearing, Diane Schuur, Natalie Cole, Chaka Khan and Rufus, The Jacksons, Earl Klugh, Prince, Robert Palmer, Paul McCartney, Michael Jackson, Spike Lee, João Gilberto, Paula Abdul, and most recently Brian McKnight, Regina Belle, J. Spencer, Norman Whitfield, Branford Marsalis, Tori Amos, Terry Trotter, a French group - "Charts," a Japanese group - "Sing Like Talking," Vanessa Williams, Brandy, Tony! Toni! Toné! and many others. His arrangements for strings are truly a revelation. Since beginning his professional career, Fischer has recorded over 45 albums as leader and has arranged, composed and/or played on another 100 plus albums for other recording artists. His discography reads like a "Who's Who" of the recording industry. 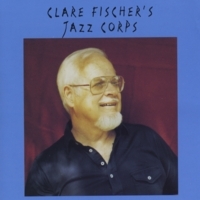 Recent releases include "Clare Fischer's Jazz Corps," a big band album made up of 20 brass, 6 woodwinds plus rhythm; and "Symbiosis," recorded with Hélio Delmiro on unamplified Brazilian guitar and Clare on digital piano. Of the "Jazz Corps" recording Clare writes, "In 1992 by chance I witnessed a drum and bugle corps competition on television and became aware of three-valve bugles. A year later my wife, Donna, and I attended a performance in La Mirada of the previous year's winner. I have experienced fine concert band performances and also good symphonies in my life, but was not prepared for what I experienced that day. The entire bugle corps was turned away from us playing softly and suddenly they turned toward us and projected a very thick chord. Every hair on my body stood up (and I have a lot of it) and I decided at that moment to buy some of these instruments. In the next year I purchased approximately $14,000 worth of bugles. After having completed an orchestrational family all the way down to the contrabass bugle, I began writing. This album is the result of this particular interest in my sixth decade of music." In January 2001 Fischer produced his first classical CD, "After the Rain," made up entirely of his own symphonic works. More recordings are listed on his website at www.clarefischer.com/ In December, 1999, Michigan State University School of Music conferred an Honorary Doctorate of Fine Arts Degree on Clare in recognition of his "creativity and excellence as a jazz composer, arranger and performer." Clare has three grown children; Lee, Brent and Tahlia; and two stepchildren, Lisa and Bill Bachman. He is married to his high school sweetheart, Donna, who he lost when he was 20 and she was 18 because her mother didn't approve of "jazzers." After being apart for 44 years, they are enjoying their storybook marriage of unbelievable happiness, now in its eleventh year. I could be trite and just say the CD is great, but the thought and craftmanship that went into the making of this CD is beyond description. Clare Fischer does it again: He opens up a whole new way of thinking about music and expression. Somewhere I read that Clare Fischer describes himself as the Charles Ives Of Jazz. "Clare," I say, "Don't sell yourself short!" Clare Fischer's romance with all things brass and shiny - in the form of a massive brass ensemble of all kinds of exotic mouthpieces, bells, valves, and slides - brings out not only his special harmonies, twists and turns, but a fresh range of brass textures - from the large to the small, from the bright to the mellow, from the dark to the light - with a few reeded friends and rhythm section. There are all sorts of surprises in this - echoes of Prokoviev in 'The Herd Moves On' (a tribute to endangered elephants not Woody - check the Clarinet choir album if you like clarinets and other brothers! ); echoes of Kenton and a great overdubbed saxophone conversation featuring Gary Foster in 'Neophonic Piece'; a faithful transcription of Konitz' famous 'Lover Man' alto solo for this great brass team also; and the not infrequent nods to Ellington and Stravinsky. Check also the clever and quirky rearrangement of the noble Cherokee. Nothing by halves in this brass symposium. Enjoy! Fischer uses the drum corps bugles mostly for color rather than flash: think Gil Evans rather than, say, Maynard Ferguson. Wonderful use of warm, dark conical brass sonorities, mixed with clarinets. A refreshing break from the usual 5/4/4 big band; deserves a sequel!